I really enjoyed Eleanor and Park but I think what's preventing me from loving it is that the last third of the book was not what I was expecting and that kind of skewed my feelings a bit. Still, I loved both Eleanor and Park as characters and I loved them together as a couple. I just wasn't expecting it to be so sad. At the same time, it's also "real life." People who complain that books and movies end too perfectly can't say that about this book, so in a way, I kind of like that about it too. 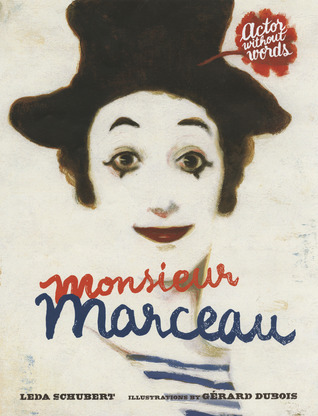 Interesting bio on the most famous mime, Marcel Marceau. I had heard his name before and knew that he was a mime, but I didn't know much else. I found his background about his life during World War II quite fascinating. Most of the biographies I read are picture books so this is a rather slow change of pace for me. I'm only on page 44 at the moment but so far it's an interesting book. I don't know. This is a little too high fantasy for me. The only reason I'm still listening is because I find the narrator's voice pleasant to listen to. I might end up abandoning it. I am so excited to be the final stop on The Hero's Guide to Storming the Castle blog tour! The first book in the series, The Hero's Guide to Saving Your Kingdom, is on my list of top 5 favorite audiobooks of all time. Plus, Christopher Healy was gracious enough to Skype with my class this year. So to say I have an affection for this series would be an understatement. 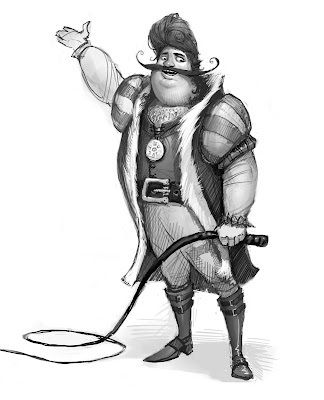 The Hero's Guide to Storming the Castle is just as funny as the first book, with the added bonus of getting to know more about the princesses who rejected the princes charming in the first book. 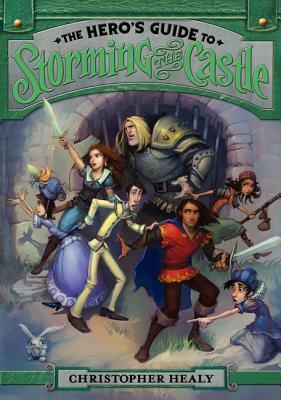 Storming the Castle Giveaway: The first THREE entrants today will receive signed copies of THE HERO’S GUIDE TO STORMING THE CASTLE and EVERYONE who enters is eligible to win a $200 gift card to the bookstore of his or her choice. (U.S. entrants only please!) You will need this SECRET CODE to enter the giveaway: Prince Charming. Enter here. 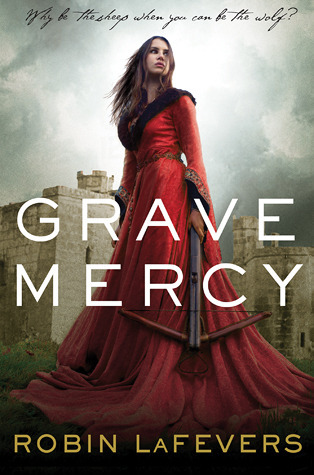 Twitter Chat: Join New York Times Bestselling author Marissa Meyer and Christopher Healy for a Twitter Chat on fractured fairy tales on Monday, June 3rd at 9pm ET. Hashtag #talesretold. There will be giveaways! 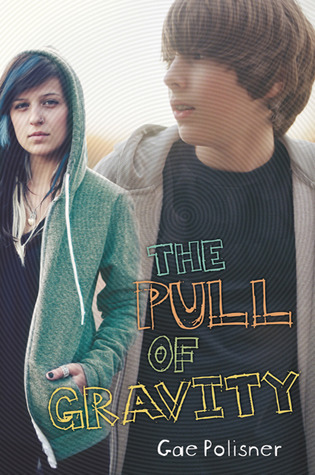 I really liked this story, I just wanted to know the characters more. I felt like the novel ended just as I was getting to know them. 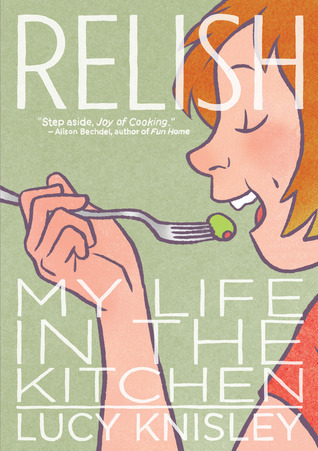 I adored everything about this foodie graphic memoir. I will be writing a longer review of this one very soon! A beautiful extended metaphor for what all classrooms should be: a vessel for inquiry and exploration. 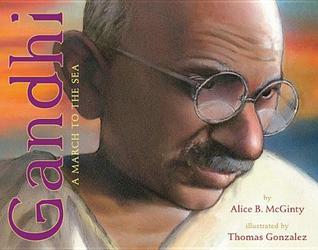 A great supplemental text to use when studying about the Salt March. This book is way more interesting than a dry, voiceless social studies textbook. When The Chew premiered on ABC a year and a half ago, it quickly became my favorite food-centric show. I loved the chemistry of the five hosts and have always adored the idea of a talk show revolving solely around food. Before The Chew premiered, Rachael Ray was my favorite food-related talk show, and though I still love Rachael (yes, I know this is a blasphemous statement for foodies, but I don't care), I am slowly tiring of her. This cookbook features some of the best recipes from the first season of The Chew, but it also includes interviews with all the hosts: Michael Symon, Daphne Oz, Clinton Kelly, Carla Hall, and Mario Batali. While I wouldn't buy this book solely for the recipes since they are after all online, I would buy it for the interviews, and even then, I'd be more likely just to check it out from the library (which is what I did). My favorite section of the cookbook was Clinton Kelly's entertaining tips, not because of their creativity and practicality, but the sheer humor of his suggestion that party hosts put marbles in their medicine cabinet to hear who's the first person to go snooping around your bathroom when they all crash to their floor as the cabinet door is opened. The recipes in this book are organized seasonally, and while I haven't tried any of them yet, I am particularly excited to try Michael Symon's spaghetti squash fritters in the fall. If you're a fan of The Chew, not much new is revealed in this book, though the interviews are enjoyable to read. If you've never watched The Chew before, the book is put together in quite an attractive, easy-to-read format and thus the recipes might motivate you to give the show a go. In the rock-paper-scissors of life, love is rock. 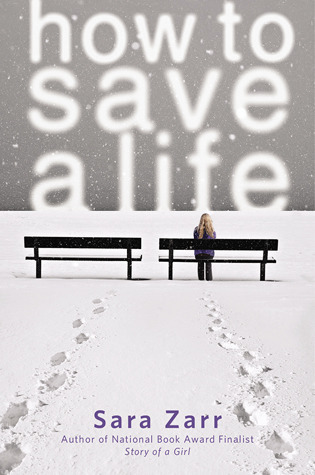 As if Jill MacSweeney's life isn't complicated enough dealing with her grief from the unexpected death of her father, now her fifty-something mother wants to adopt a baby to fill the void left in her heart by her deceased husband. Jill's mom Robin decides to take the open adoption route and soon 18-year-old Mandy Kalinowski from Omaha, Nebraska is staying with them, ready to give up her baby to Robin in just a few weeks. Jill is less than thrilled, and she does very little to hide her disdain from her mother or from Mandy. 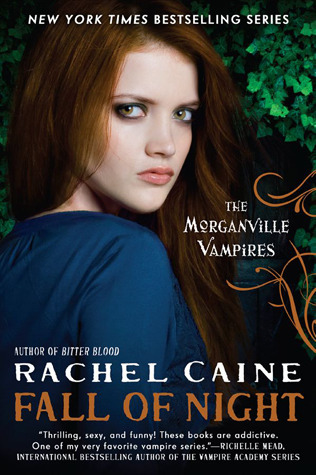 Told in alternating points-of-view between Jill and Mandy, readers find out very quickly that there is a great deal to dislike about both girls: Jill's iciness and tactlessness, and Mandy's frequent and numerous lies. As the story progresses however, and the girls' stories begin to intertwine, both become more empathetic to the reader. This is one of those books you end up liking more than you think you will. When I first started listening to the audio, I wasn't sure what to expect, but by the end, I found myself shedding some tears. 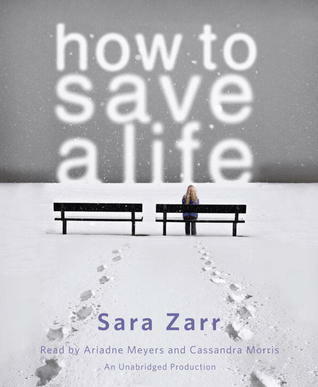 Sara Zarr subtly and seamlessly finds a way to make you eke out a place in your heart for these characters you were certain you would continue to dislike throughout the entire novel. What's that you ask? Well, that is the inside of the book jacket for the Taiwanese version of Level 2, and in it, I have been quoted! I'm the third from the bottom. Both Aristotle and Dante never knew what friendship was until they found each other. As both self-proclaimed loners, their relationship begins the day Dante offers to teach Ari how to swim at the local pool. From that moment on, the two boys share a bond that is almost palpable, and even distance, family complications, and near tragedy cannot break it. Sparse, gentle, beautiful. 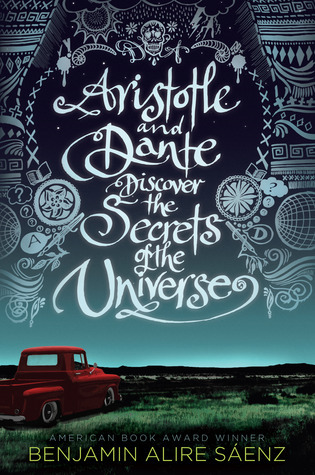 Those are the best words I can use to describe Aristotle and Dante Discover the Secrets of the Universe. Ari, Dante, and the entire cast of characters in this novel are some of the most loveable and memorable in all of literature. There is no forced conflict here. 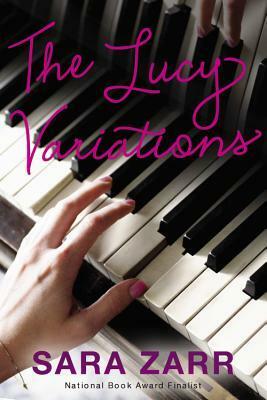 This is a novel where the plot doesn't move the story, the characters do, and that's just how I like my novels. I could draw this out and make this a longer review, but I feel like I'd be doing the book's sparse, straightforward style a disservice by droning on about it. It's something you just need to experience for yourself. 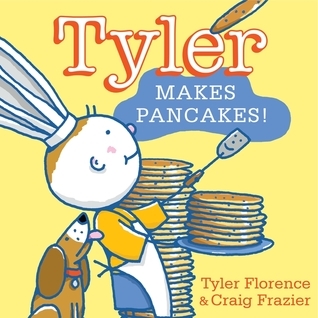 Its multiple 2013 ALA awards, including a coveted Printz honor, are testament enough to its timelessness. Last night I had the privilege of attending the A.S. King event at Nicola's Books in Ann Arbor with a group of teacher and writer friends. 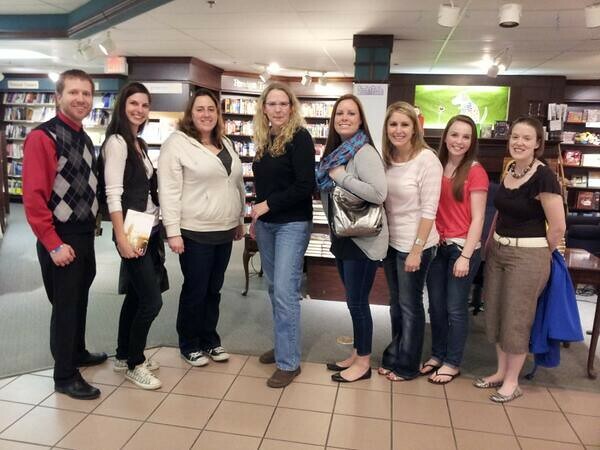 It was by far one of the best author events I've ever attended. Amy is not only thought-provoking and entertaining, but she is downright hilarious too. She had our group of seven in the front row laughing so hard we were crying and snorting at the same time. Amy chose her author name because it spells out "asking" and also because she wants her books to be viewed as gender-neutral. She wrote her first four novels on a Swedish typewriter that had four a's on it. Every book she writes has a prologue out of sheer stubbornness. 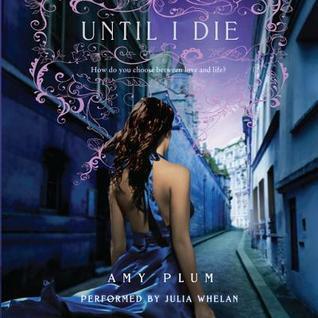 To mess with the people she's encountered who insist on never reading a book's prologue, Amy decided that every book she writes WILL have a prologue and unless you read it, you will be totally confused. Every book she has written has pieces of her life in them. Most recently, with Ask the Passengers, she does send love to the people up in planes. 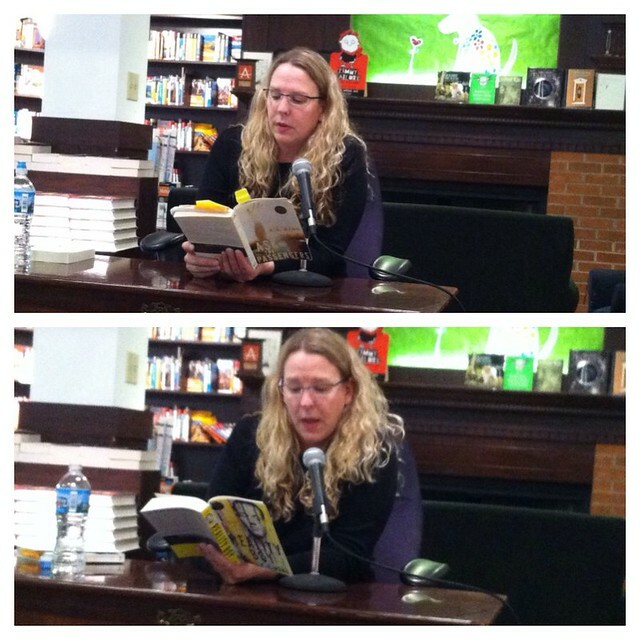 If you ever get a chance to meet Amy in person, ask her to tell the story of when she received the phone call telling her she had won a Printz honor. It's by far the best award phone call story I've heard from an author, like something out of a movie. Based on the prologue that she read to us last night, Amy's newest book, Reality Boy, set to come out in October, is a "Go directly to the top of the TBR pile" kind of book. It's about the aftermath of being a child of reality TV and the implications that has on the main character's life as he grows up. 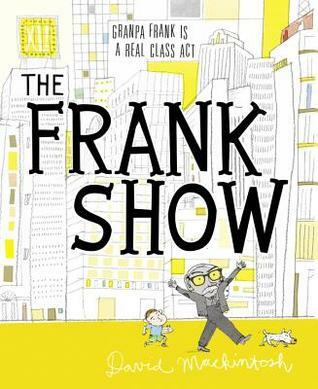 Talk about thought-provoking and a commentary on our fame-obsessed society! It was such an awesome event that we stayed until the staff at Nicola's had to practically kick us out so they could close. 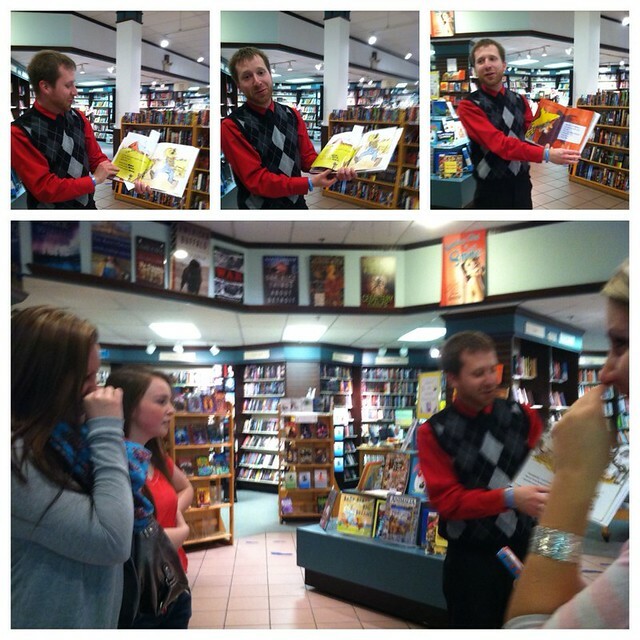 In between meeting Amy and practically getting kicked out of Nicola's, we did have another moment of awesome: an impromptu story time with Brian Wyzlic reading Click Clack Moo: Cows That Type by Doreen Cronin. We were pretty much rolling on the ground from laughing so hard. Brian is quite an expressive reader. I wish I had recorded it instead of taken pictures. I read two picture books this week that I absolutely adored. 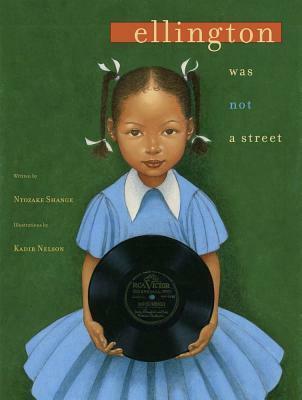 Based on Shange's poem "Mood Indigo", Ellington Was Not a Street is a gorgeous picture book full of moments from Shange's childhood when the influential African American minds such as Duke Ellington, Dizzy Gillespie, and W.E.B. DuBois, gathered at her house. 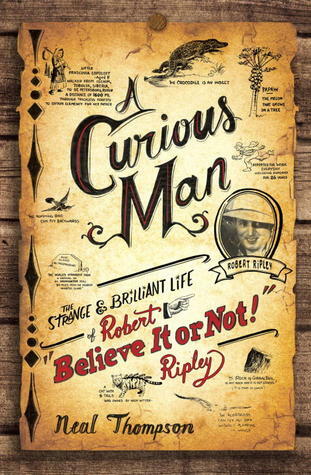 There are many opportunities for students to make inferences and build background knowledge in this book. 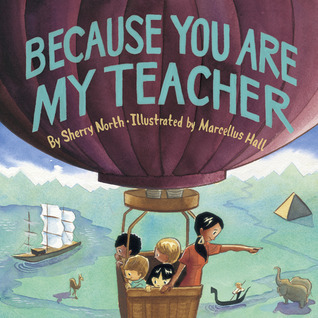 Scaffolding could be built with older students by sharing just the poem first, then showing them the poem with Kadir Nelson's stunning illustrations, and finally, reading the author's note at the end which lists and explains all of the men mentioned in the poem. The meaning of "Mood Indigo" and even the picture book itself won't completely make sense for kids without background into who the men were that are mentioned in the poem. 1) Mother's Day is coming up next weekend. Have students write "Because you're my mom" pieces. 2) This is an example of an entire book using one of Jeff Anderson's infamous AAAWWUBBIS (As, Although, After, When, While, Unless, Before, Because, If, Since) introductory elements and therefore can be used to show students how they can correctly use because at the beginning of a sentence so that it's not a fragment. But let's also look at how downright adorable this book is. 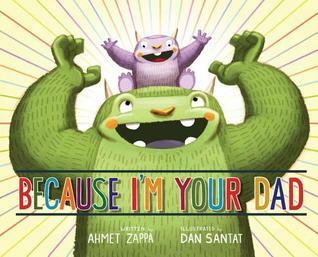 After reading it, I have come to the conclusion that Ahmet Zappa is the dad every kid deserves to have. He clearly adores his daughter Halo and it shows through in this tearfully sentimental and also chuckle-inducing story. When beloved chef Eve Aronoff closed the doors of her eponymous restaurant eve in 2011, foodies all over Ann Arbor and the metro Detroit area grieved. But while Aronoff did not replace eve with another fine dining establishment, she did begin a new project in late 2010, opening a casual dining establishment called Frita Batidos. The food at Frita Batidos is Cuban-inspired, but Aronoff will be the first to tell you that it is not traditional Cuban food. 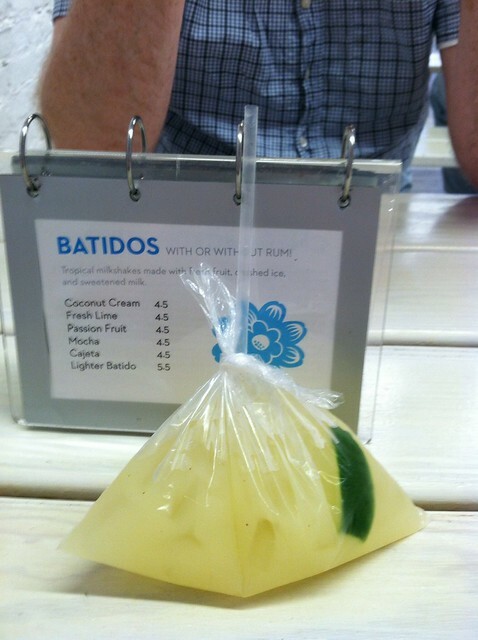 The name Frita Batidos comes from two staples of Cuban street food: A frita, which is a burger traditionally made from chorizo and topped with shoestring french fries and a brioche-type bun, and a batido, which is a tropical milkshake made with fresh fruit and sweetened milk. 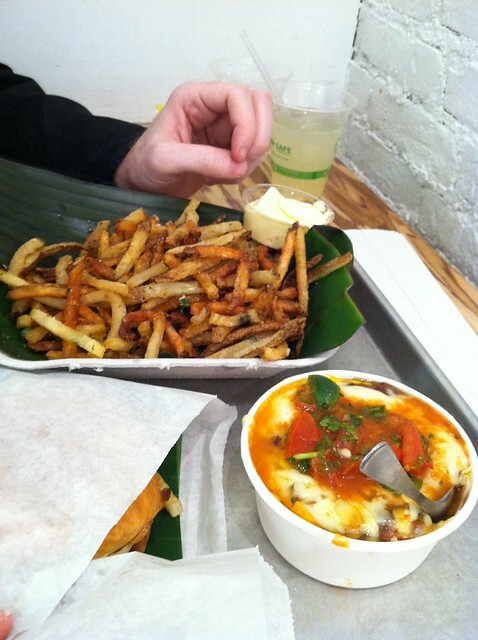 My husband and I have eaten at Frita Batidos three times now since its opening in 2010 and each time has been a new, delightful adventure. When you walk in, you a greeted by a sleek, white space. 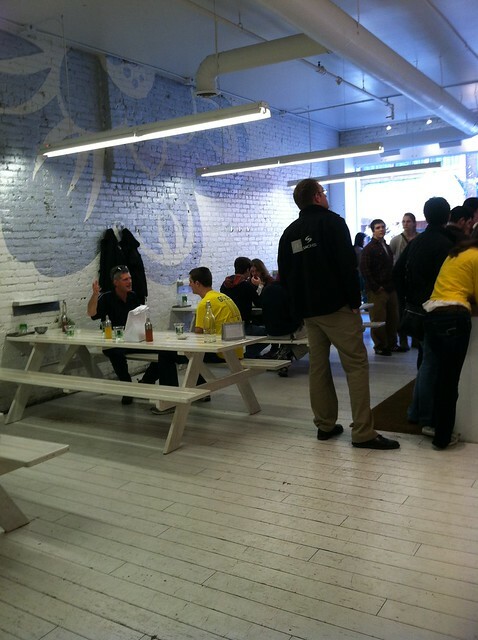 You place your order at a counter and then seat yourself at one of the communal picnic tables or a bar stool against the wall. 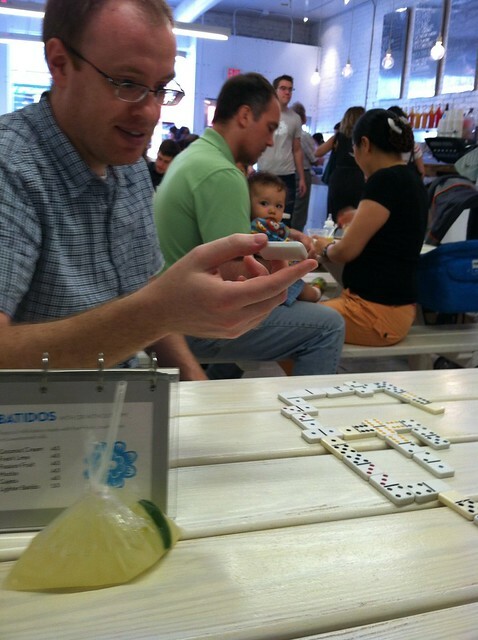 While you wait for your order, customers can entertain themselves by playing dominoes left on the picnic tables. 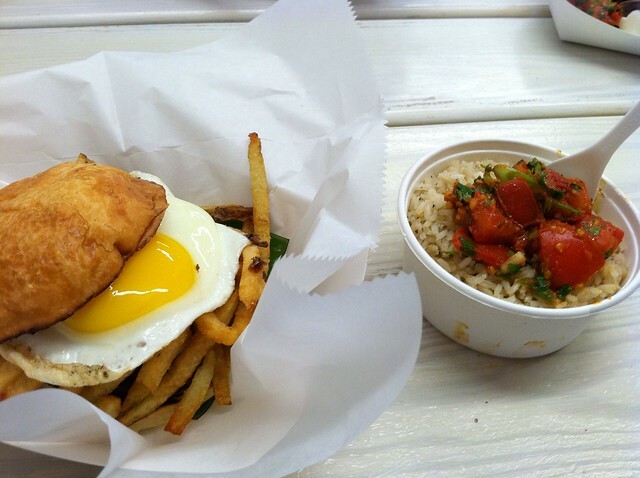 Once your meal does come, however, it will be a no-brainer to push the dominoes aside in favor of some mouth-watering Cuban-style street eats. If you are a fan of Cuban food like I am and you're in the area, I highly recommend a stop inside for fun, casual meal.